UPPER EGYPT (ANS) — A church in the village of Naghaa Halaf Allah Jaber in Sohag governorate, Upper Egypt, had to be evacuated on April 12 after it was surrounded by local Muslim villagers protesting about repairs to the building. Christian Solidarity Worldwide (CSW) reports that at the time, approximately 200 Christian children were inside the building attending Sunday school, which takes place every Friday at 4:00 pm. The police arrived at the venue promptly and evacuated the panicking children and the two priests serving the congregation, Father Basileus and Father Bakhum. They were driven away in an armoured vehicle and the building was closed to appease the crowd. Two people were wounded during the incident, including Father Basileus. A local Christian informed CSW that Christians in the village started using the building for prayers and other church activities ten years ago. It was officially registered four years ago as a “church organisation” under the name of “Anba Karas Religious Association” for social and church activities because the closest legalised church is situated 20km away in Al-Sawamee village. 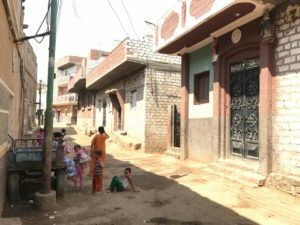 CSW said the situation began to escalate on April 11 when the village mayor, a Muslim, came to the building to stop construction on an additional fourth floor. The mayor started shouting abuse and called on other Muslims to join his protest. Council authorities arrived shortly after being summoned by the mayor and confiscated all construction materials. Protests continued on April 12, prompting the police to evacuate and close the building.